Announcing your adoption can be so exciting, but how to make this as special as possible can be difficult. There are so many different avenues to go down, and with the multiple upcoming fees that adoptive parents constantly face, announcing cheaply is a priority. Here are 8 cost-conscious ways to announce your adoption. Making a video can help show your loved ones how special this adoption is to you and your family. It’s also a great opportunity to answer questions you know will be asked and to explain your journey so far. It’s a wonderful time to involve your friends and family in the small parts of your experience and show them what the timeline looks like until your child comes home. Having a picture of your children with shirts or a sign that says “Big Brother” or “Big Sister” can pull on your heartstrings. What a great way to announce your adoption and involve the children already in your home in the excitement of their future sibling. If you are adopting internationally, taking a photo with a heart over the country you have chosen can be a great way to announce your adoption. You can’t go wrong with cake! While surrounded by your friends and family, celebrating with cupcakes can be a great way to announce you’re adopting. Whether you decorate them pink or blue to show the gender of your future child, you use the icing colors of your future child’s country’s flag, or you draw a puzzle piece on the top and say “we’ve found our missing piece,” everyone will be so excited to celebrate with you. There are quite a few super sweet adoption books out there that you can use to announce your adoption. Whether you give the book to your children to announce the addition of a new sibling or you take a picture of your family reading this book to announce to those on your social media accounts, you can’t go wrong. Some books that have gotten lots of love from those in the adoption world are God Found Us You by Lisa Bergren and I Prayed For You by Jean Fischer. If you have a dog, cat, bird, or other animal that your family loves and adores, using it to help announce your adoption can be a cute and fun way to involve the whole family! Putting a sign around the pet’s neck saying “Big Brother,” “Big Sister,” or “Protective Detail Starting Soon” can be a great way to announce your adoption. It is sure to get lots of love from friends and family. 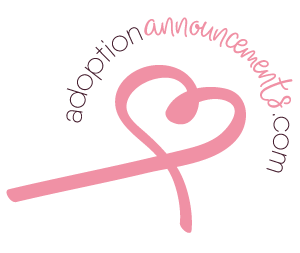 A great way to announce that your family is adopting is to take a picture with all of your family members sitting in chairs with one empty chair.I have seen some people put a globe in the chair if they are adopting internationally or a chalkboard with the announcement details. If you didn’t share your adoption until after you were matched or already home, the absolute best way to announce your adoption is with a picture of your child. Everyone will jump for joy as they look at the face of your new child. There are so many ways to announce your adoption, and price should not be a reason you decide against it. Don’t let cost stand in the way of announcing the growth of your family with joy and pride. Choose a way to show your loved ones what has happened in your life and let them celebrate with you.